1. - Pepperoncini Juice - To add a healthy zing to any food dish instantly, add a couple of tablespoons of juice from a jar of pepperoncini. This is a good thing from soups to salads to main dishes. NOTE: Add the juice to ready-to-eat meals because the enzymes and vinegars from the pepperoncini will react to aluminum and other metal pans. 2. - Turmeric and mustard - Studies show that besides tasting good, turmeric may help fight infections and some cancers, reduce inflammation, and treat digestive problems. TIP: Add about 2 teaspoons of turmeric to your jar of mustard to give you that extra healthy punch. 3. - Super Simple 30 minute Thanksgiving Turkey - This is arguably the easiest Thanksgiving turkey recipe!! Items needed: One fresh or thawed turkey, one disposable aluminum roasting pan and aluminum foil, about 12 oz. of orange juice, 12 oz. of beer, Bragg Liquid Aminos, and olive oil. First 15 minutes; Before you go to bed, take the turkey out of the wrapper, wash turkey, place in aluminum roaster, add about 12 oz. of orange juice, 12 oz. of beer, about 2 oz. of Bragg Liquid Aminos, add water to fill the aluminum roaster halfway. Rub the turkey with olive oil and cover with aluminum foil. Turn oven on to 325 degrees, place turkey in the oven and go to bed. When you wake up in the morning, uncover the turkey and add more water if necessary for gravy. Let turkey continue roasting until the meat falls away from the bone. Then the turkey is done! Second 15 minutes; Take turkey outside to a picnic table with two extra bowls. 1. Pour gravy in one bowl and set aside to cool. This allows the fat to arise to the top. Scrape off and feed the solid fat to the birds. 2. With your hands just de-bone the turkey. Put the meat in the second bowl. 3. Put the bones and scraps in the aluminum roasting pan and throw it away (or take indoors and boil for turkey soup). Super Simple TIP: This turkey can be made a couple days in advance and just heated up for the holiday dinner. 4. - Tartar Jakupca - A truly decadent simple snack! Start with a nice choice piece of lean beef. Cut up into bite size pieces. Season with your favorite spices or add a dollop of mustard to raw onions on the side. Take a piece in your mouth and enjoy. You will find the meat will melt in your mouth like a fine chocolate. TIP: Chew the meat like you would a piece of gum, when the flavor is gone, don't swallow, but as elegantly as possible remove the remaining tid-bit from your mouth to your plate. Repeat until everything is gone. Afterwords, put the remaining tid-bits in the freezer as a snack for the dog. Is it healthy? Some people think eating any meat is bad for you, some studies show eating red meat is unhealthy and most people will say eating raw meat is dangerous...this makes this taboo forbidden food all the more delectable! 5. - Anbesol - Designed to alleviate toothaches, this over the counter medication has many other advantages. TIP: Can be used to numb burns, scratches and bruises, also used to stop the itching on some rashes and mosquito, bug and bee stings. 7. - Granola Bars - Before leaving the house for the airport, take a box of soft baked granola type bars and stuff a few in your pocket, a couple in your purse, some more in your carry on baggage and the rest in your checked luggage. Now, no matter where you are or how long a line you are stuck in, you have a healthy snack to tide you over. The soft granola bars work the best because if they get crushed in your bag, they won't crumble when you open them. 8. - Water Bottle - To keep refreshed, try to keep a plastic bottle of water with you at all times when travelling. TIP: Before you enter any TSA secure area, customs, or any security check point, empty your water bottle. After you go through security, you can then fill it up at any water fountain or bathroom afterwords. 9. - Yogurt - The big mistake people make when traveling is filling up on junk food. The second mistake is totally changing from what they eat at home. That's one of the problems with staying on cruise ships or in a hotel--no food control. So they end up feeling ill, and bloated, and they put on weight, and it spoils their fun. TRY NOT TO DO THAT!! One thing that actually helps is eating natural yogurt. Natural yogurt is the one food that is the same anywhere in the world. TIP: Eat about a cup of non-commercial yogurt everyday while traveling helps to stabilize your system and adjust to different foods and conditions. You feel better and have a better trip. 10.- Holiday Home Spa Treatment - If you can't get away to a professional spa, try this out. TIP: Run a hot bath, add some dish washing liquid (I prefer Lavender Palmolive Dish Soap) to the bottom of a cup and hold under the tap. Repeat as necessary until you have a relaxing bathtub full of bubbles. 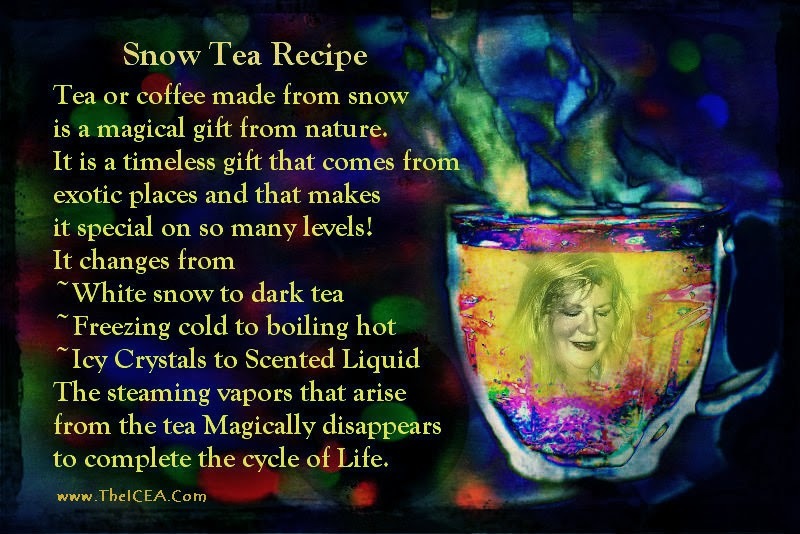 BONUS TIP: To make a Swiss Herbal Tea, add a couple of Ricola's to any pot of tea to bring a touch of the Alps to your home spa. EXTRA BONUS TIP: Coffee or tea stains in your favorite cup or mug. TIP: Forget about them because life is too short to worry about the small stuff! 11.- Home Made Flu Remedy - The weather gets very cold and damp in by the Ark in Berea and people tend to spend a lot of time outdoors, so to keep everyone healthy and in a cheery disposition, here is our family remedy. This simple and rustic recipe for Chicken Soup has no measurements. Feel free to add ingredients to your liking. The beer is optional. canned chicken broth or mustard and Bragg Liquid Aminos. 12.- Baking Powder - has been shown to fight cancer, stave off colds and flu, and even treat radiation poisoning…all for just pennies a day? Baking Soda can also be helpful in combating contagious illnesses like colds and flus. When traveling in remote areas, many travelers are seeking natural alternatives to harsh and ineffective antibiotics and vaccines. The broad spectrum of uses for baking soda serves as a powerful reminder of a commonly overlooked truth about medicine: the simplest time-tested solution is often the best one. 13.- Starving Artist Cake - David and I made this cake because we liked to have a healthy and hearty cake that is easy and fast to make. This cake takes about an hour to make from start to finish. Add all the dry ingredients separately and Add all the wet ingredients separately and then little by little mix them all together. The end batter should be the consistency of cooked oatmeal. Add to a greased baking pan bake at 350 degrees for 55 minutes. 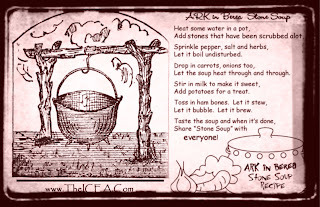 14.- Famous ARK in Berea Stone Soup - Stone Soup is a European folktale told in many countries, about villagers who believe they're turning stones into soup. In this fable, three soldiers, hungry and tired, pass through a war-torn village. Embittered and suspicious from the war, the people hide their food and close their windows tight. One of the soldiers cleverly suggests making a soup from stones. He claims the soup tastes great but just needs a little garnish to complete the dish. 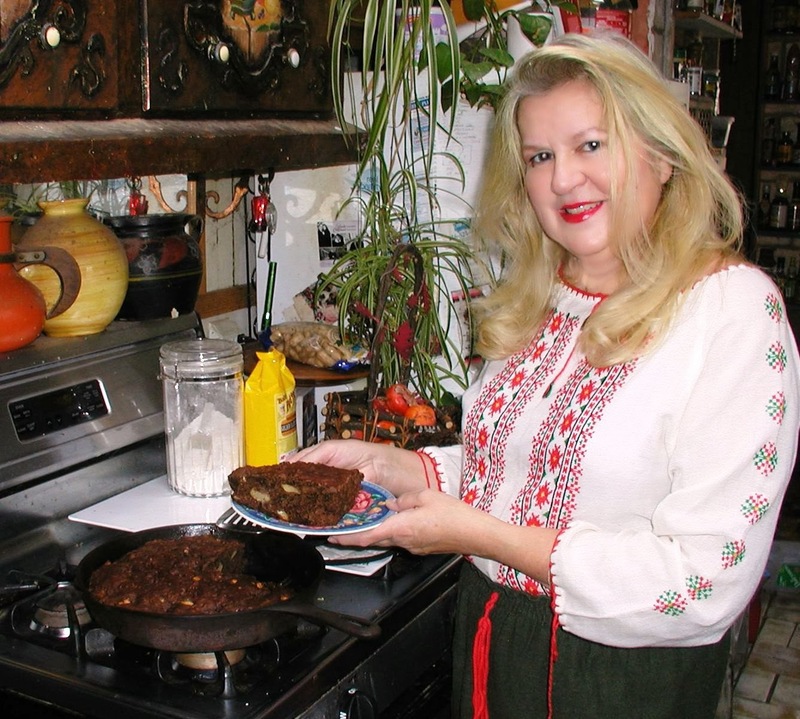 Intrigued by the idea, everyone contributes what food items they have until together they make a delicious and nourishing meal that feeds the entire village. 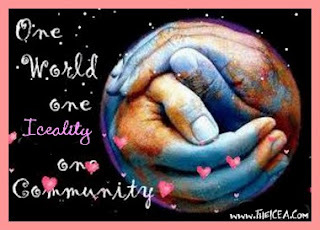 This story personifies the notion that when a community works together, each person giving what they can, we have everything necessary to meet our basic needs. 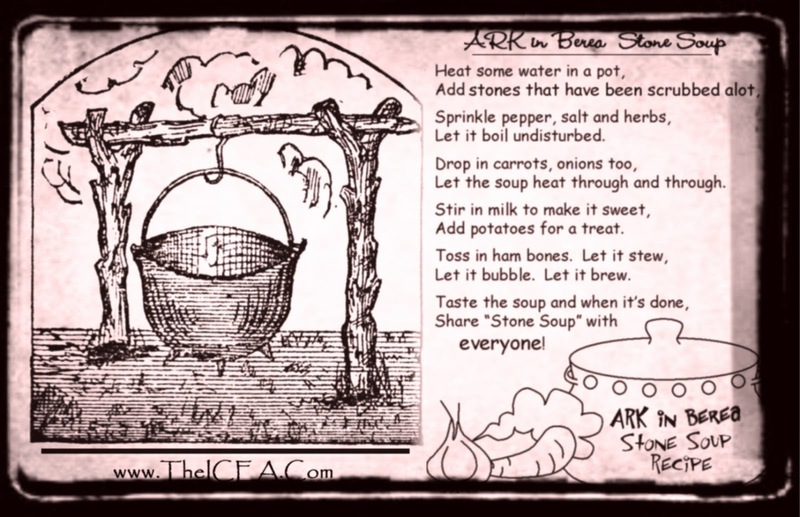 This is the ARK in Berea Recipe for Stone Soup. 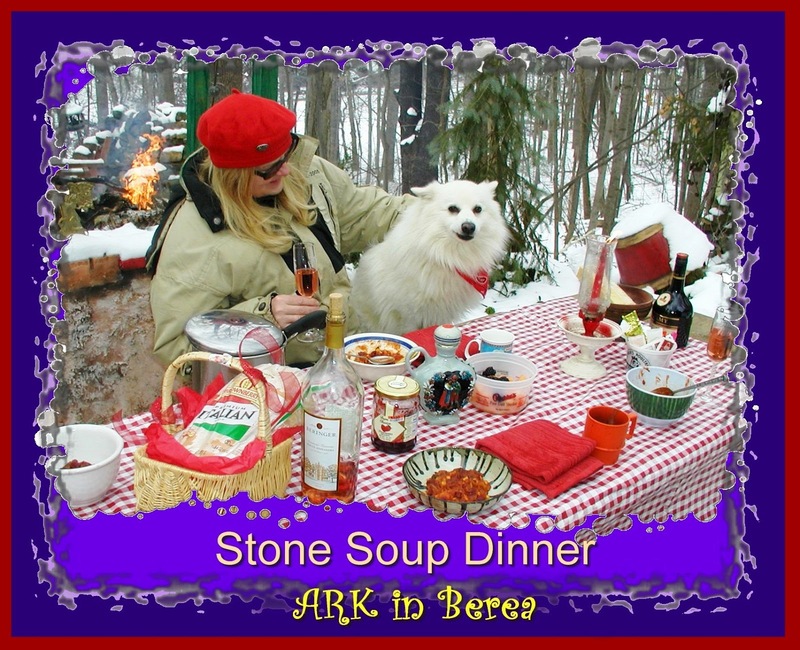 The basic premise of a Stone Soup Dinner is that you invite friends over and have them contribute ingredients to a soup that you all make and share. Especially the children have to be involved and make their contribution. They are expected to travel down the MSR towards OM. When they reach the river, they wade across to Urth Island, making their way across to the Belowce Plain. This is where the tastiest and most tender stones can be found. 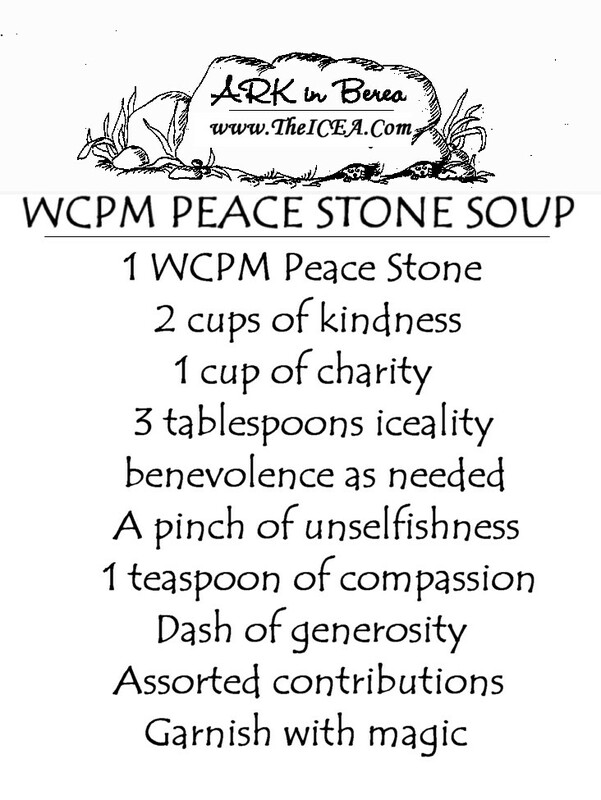 They collect their stones and return to the ARK in Berea where they scrub and clean their stones, make a wish and add them to the soup. 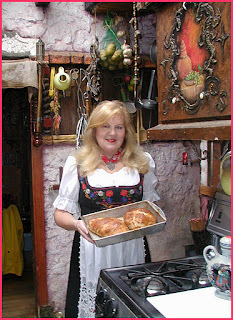 (I should probably mention here that the stones are not actually eaten!!) At the ARK in Berea, they are collected after dinner and used as paving stones in the front courtyard. 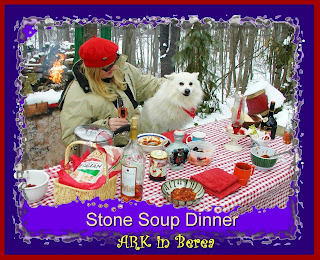 Stone Soup has been made at the ARK in Berea since 1976, usually as a Sunday Brunch, it is one of our favorite "recipes" because there is no recipe — Water, Stones and just whatever food you have available. That belief in cooperation and the premise of strength in numbers also serves as the foundation for the ‘Worlds Children Peace Monument’ and ‘Great American Peace Trail’ and shows what is possible when a community comes together. 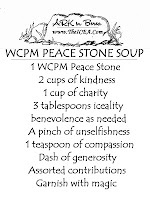 The WCPM Peace project, through the Stone Soup analogy clarifies how deceptively simple it can be to satisfy many human, economic and environmental needs. There is no real cost, but a great deal of value is exchanged. Furthermore, it’s a value that lies stored as latent assets, residing silently in people’s lived experience until brought to life in the moment of social sharing. Much of what we seek in Life is simply these moments of connection to something greater than the separated sense of self. There is a future for all living things by if we combine new academic scientific practices with practical older cultural customs through the Theory of Iceality on Environmental Arts.